Billy Bob is a character from the Saturday Supercade episode Mississippi Madness. He is the right-hand man of a trio of thieves who long for the Emerald of the East. He wears a striped shirt, and, like his two partners Belle and Colonel Culpepper, speaks in a stereotypical wild western dialect. 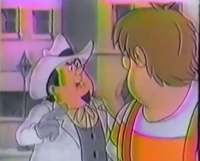 Billy Bob was first seen in the beginning of the episode, imtimidating Mario and listening to Colonel's plan to steal the emerald. He then notices Colonel taking interest to Donkey Kong and deciding to use him for his plans. Billy Bob is not seen again until Donkey Kong is forced to flee to the jungle. Colonel and his cronies give chase on a personalized motorboat, and they succeed in pushing Donkey Kong out of the way of Mario's trap, causing the emerald to fall into Colonel's hand. However, this also causes the cage from Mario's trap to drop onto the group. Billy Bob is not seen again for the rest of the episode, though it is assumed that he was arrested by the police for his being an accomplice. This page was last edited on December 3, 2018, at 03:55.